Take two overlapping circles. 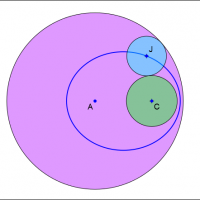 Examine the locus of the center of the circles tangential to both. It seems to be an ellipse with foci at the centers of the two circles.